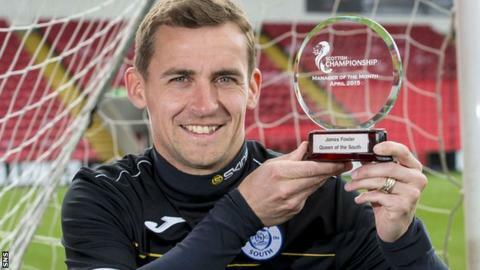 Queen of the South's James Fowler has been named the Scottish Championship manager of the month for April. Four victories and a draw last month, including wins over Rangers and Hibs, helped Queens to a fourth-place finish and a two-legged Scottish Premiership play-off quarter-final against Rangers. Fowler, 34, joined manager Jim McIntyre at Palmerston in June and took on the role when McIntyre joined Ross County. In March he was awarded a new contract until the end of the 2015/16 season.